Your dimly lit hellhole of a closet, just a few paces from an an absolute dump. At least you have ample space for your bed. ...and your backup hellhole between owl hell and highwater. Your closet, a dimly lit hellhole above the dump. Your other closet, an even more dimly-lit hellhole below the Morgue. Your dimly lit hellhole of a closet. At least you live next to a farm. Your dimly lit hellhole of a closet. 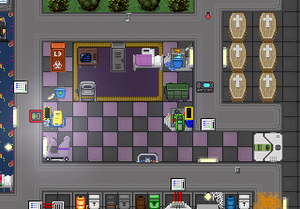 You sleep near a bottle of cleaning fluid, wake up to the sound of horns and honking from your next-door neighbor, and leave for work only to that the medical bay is somehow already flooded with blood and urine. 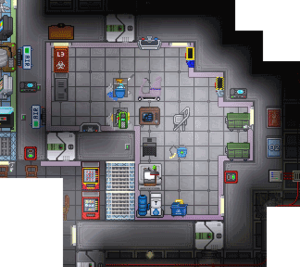 Your dimly lit hellhole of a closet below Crew Quarters. At least you have a better view of space than the Captain. Your dimly lit hellhole of a closet, above an arcade deep under the sea. 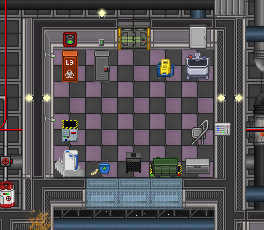 Your equally dimly-lit outpost west of Arrivals, the Janitor Supply Closet. Your quaint little kingdom by the dock. 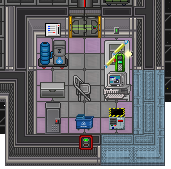 The Janitor is a modest man, wholeheartedly devoted to their simple yet Sisyphean goal of keeping the station clean and tidy. 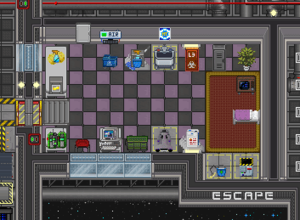 Like the Captain, they get their own dimly lit office, called the Custodial Closet, stocked with a variety of unique toys to play and clean with. 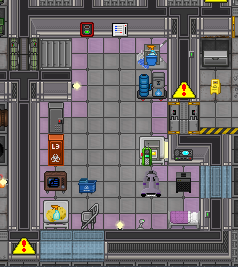 With its easy-to-learn, hard-to-screw-up tasks and its general insignificance in the grand scheme of things, Janitor makes a great beginner job! All of these items spawn in the custodial closet. The basic floor-cleaning device. Using it on a floor will attempt to wash it. Before washing can occur, the mop must first be wet. Using it on a floor with a puddle of fluids with attempt to dry it and soak up the liquid into the mop. You can also use it in self defense like a spear via clicking a distant tile. Can hold about 200 units of liquid to dip your mop in, but must be dragged around behind you. Expect it to get pushed around constantly. Used to wet a mop or transfer liquids from a water tank to the mop bucket, though it's usually faster to click-drag the tank onto the mop bucket to fill it up to the brim in one go. Makes a helmet if wirecutters are used on it, but it also becomes useless for holding liquids. It functions much like a segway, as you must drag yourself onto it, and you may be pushed off. Unlike a segway however, you will coat the floors with any chemicals you put in its reservoir tank when you turn the buffer on, and it will dry off floors with puddles of fluid when it's off. Comes filled with a mixture of water and space cleaner. Put these down after you mop a busy intersection and simply point to them and sigh after people slip on wet floors. Mopping without putting down wet floor signs is generally considered grounds for Light Mockery and Amusing Tickets & Fines. The janitor's (mostly) unique footwear. Prevents slipping on wet floors when worn, though you are still vulnerable to space lube, ice and certain other chemical spills. Generally, only one pair of galoshes can be found on the station, securely locked behind a custodial supplies closet in the Custodial Closet. There may be another pair lurking somewhere in deep space. Besides killing the chef's only friend, these can be used to just annoy folks or for more nefarious purposes with the right equipment. Anyone who steps on an armed mousetrap while barefoot will be stunned and take damage. A powerful anti-filth explosive. Click on it while it is in your active hand to pull the pin, then throw it. Explodes in a big cloud of foam that will remove most filth, but make the floors wet. Some of your bottles contain space cleaner, others are empty and be filled with whatever reagent you desire. 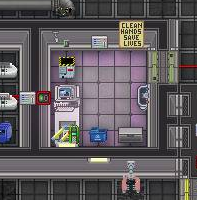 If you're more interested in doing your job as opposed to slipping people up, stick to space cleaner as it actually cleans up dirt and blood and what-not, unlike bottles filled with pure water. Use it to dry up floors and puddles of liquid. Or slap people in the face with your liquid of choice. Click on in-hand to wring it out once it gets too full. On the Oshan map you can get them by hitting a sponge coral with wirecutters. A big green cart for stuffing litter (or corpses) into. Expect it to be pushed around and the items spilled. A lot. Comes in two varieties, both otherwise functionally identical: Standard (black) and bio-hazardous (red). Can fit a number of normal sized items into them, including other trash bags for extra recursion, and can be disposed of easily in either a trash cart or in disposal chutes. Wear it on your uniform slot and channel your inner Frank. Just ask genetics before you start eating the traysh. There are a few different objectives like this, but they're all the same, they just want there to be no messes that you can clean up with your mop in the targeted area. 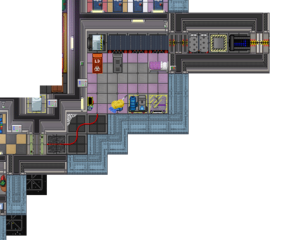 With the exception of the bar and medbay, this typically happens without you doing a thing. But if you want to be more proactive, bug the roboticist for a cyborg arm and make a cleanbot. Deliver the cleanbot to the place the objective requests. Then walk away, you're basically done. 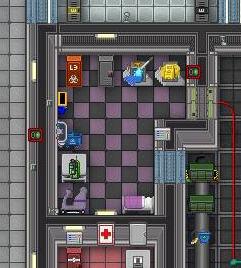 The Syndicate janitor is well-equipped for a messy, horrifying rampage. His cleaner grenades appear to be regular at first, but in fact lay down a mess of acid and space lube in their path. Anyone who holds still will be horribly burned; anyone who runs away or moves into help will smash their face as they slip on the space lube. Your regular cleaning grenades also serve as an excellent getaway tool, slipping up the security forces out for your blood while you run off unharmed. If you can gain access to chemistry, you can load your empty spray bottles with devastating concoctions or turn them into makeshift flamethrowers. Finally, the trash compactor, disguised as a regular trash container, will quickly turn any slipped victim you capture into a cube of meat that explodes into messy (and uncloneable) gibs. 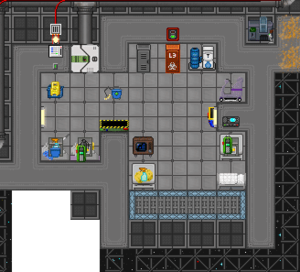 You COULD use your maintenance and disposals access to skulk around silently dispatching and disposing your targets... but that would be lame. Traitor janitors are all about live fast, die young! This page was last modified on 21 April 2019, at 21:15.